It’s simple and easy to get a Motability car from one of our TrustFord dealerships across the UK. Contact the Motability specialists at your local TrustFord dealership to arrange an appointment, or fill in the form below. All our dealerships are easily accessible. Our Motability specialists will ask you about your needs and help you find the right car to suit you - and arrange any neccessary adaptations. Find out more about visiting TrustFord Motability. Choose the car you want and we’ll arrange all the paperwork. Motability cars are leased on a three-year basis, with all the maintenance costs included. Many Motability cars are available with nil advance payment - meaning you don't have to pay anything upfront. Our local TrustFord team will be in touch throughout the three-year period to help you with the maintenance of your car. 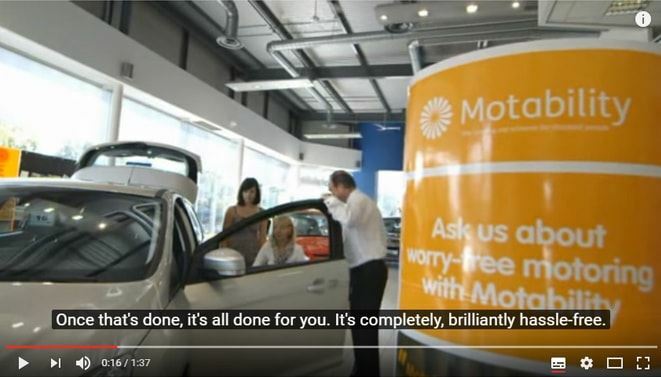 The Motability scheme was set up by the Government in 1978 and has so far supplied over 2 million cars and powered wheelchairs to disabled customers. The scheme is now directed and overseen by Motability, a national charity. They work closely with Motability Operations, who deal with the finance, administration and maintenance of Motability cars. There is no upper age limit. As long as you receive one of these allowance payments, you are eligible for Motability at TrustFord. If you want to check the details of your allowance, contact the Department for Work and Pensions, or ask us to help. Up to two named drivers are included when you lease a Motability car. So you can still lease a car even if you don't drive yourself – you simply nominate two drivers who can drive on your behalf. These can be your friends, family or carers. You can even add a third driver at an additional cost. Nominated drivers should normally live within five miles of your address. You’ll also need to confirm that all proposed drivers agree to the terms and conditions for using a Motability car. Please bear in mind that proposed drivers with certain convictions, disqualifications or endorsements within the last five years will not be allowed. Contact your local TrustFord Motability specialist by completing the form below to go through the details. As part of its welfare reform programme, the Government has started to replace Disability Living Allowance with a new benefit called Personal Independence Payment (PIP) for disabled people aged 16-64. Update: Read more about the PIP transitional support package, and how it may affect you. Find out more about how PIP works, if you're eligible and how to apply for PIP here. Q. Do you have specialist people who can help? We have a dedicated team of Motability Specialist to help with your motability needs. You'll find a Motability Specialist at your local dealership. Q. How will I take a test drive? Our Motability Specialists can arrange test drives depending on your needs. If you get in touch with us and talk us through your requirements, we'll set up everything you need. Q. How do I get a TrustFord car on the Motability scheme? We will organise all the application and paperwork needed to get a Motability car. You can find out more about eligibility on our Motability hub page. Q. What if I need a car to be adapted? Our Motability Specialists will organise for any adaptations to be fitted to suit your needs. We'll talk you through all the car's features and help you feel comfortable before driving your car away. Q. What happens at an appointment with a Motability Specialist? Our Motability Specailists have taken disability awareness training, so they're trained to help you whatever your needs. They'll talk you through the scheme and how it works, with no pressure to buy. You can also rely on us to offer you tea or coffee at any of our dealerships! Q. Do your dealerships have easy access? All our sites all have disabled parking and wheelchair access, so your visit can be as comfortable as possible. Q. What if I don't know anything about cars? Our teams are knowledgable about our products. We can guide you through the different models available, depending on your needs or disabilities. Q. What if I can't get to a dealership? We can arrange a home visits if you're unable to visit us. Simply contact the Motability Specialist at your nearest dealership and tell them about your needs. Q. What happens throughout the Motability scheme? You'll get a Motability car for three years. During that time, we'll offer you ongoing assistance in terms of servicing, as well as collection and delivery services. We'll also contact you towards the end of your contract when it's time to renew. Q. Is it good value at TrustFord? We have a market-leading range of Ford vehicles with low affordable advance payments. So you can trust us to find the right vehicle to suit your budget. Find out more about our Motability scheme by contacting the Motability Specialist at your nearest dealership.